It’s dark, late and time is running out…. It’s dark, it’s late and the November evening light is seeping away. We had no summer and now out of season, a patch of hedgerow is coming back into bloom. 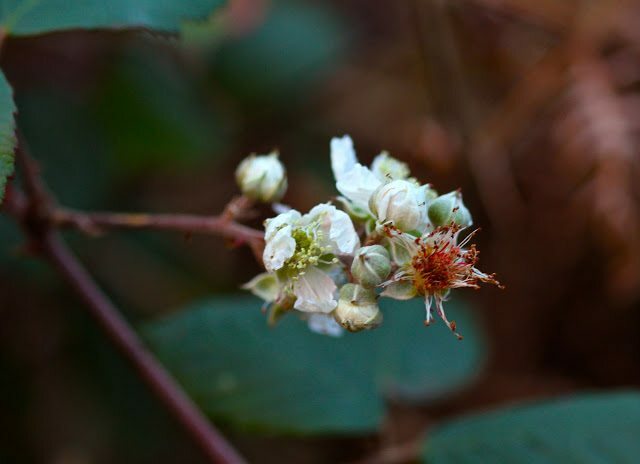 While hoping to snap berries and rosehips, here I am taking dark photos of blackberry blossoms and buds. 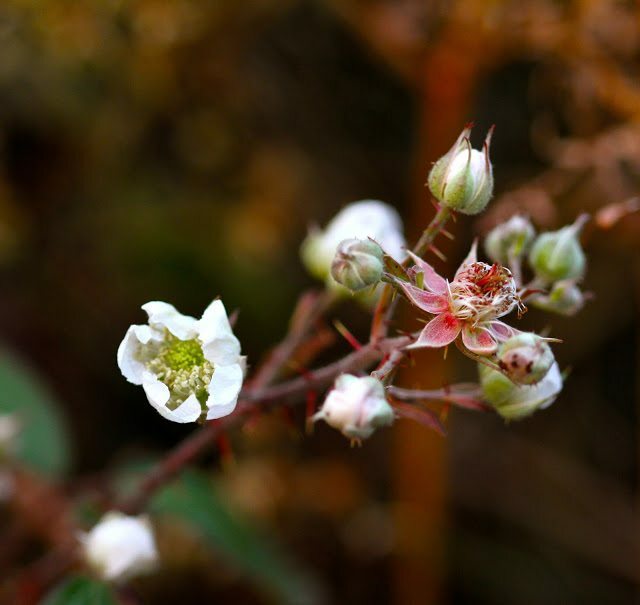 Sprinkles of life in the shadowy withering tangle….Late blooming is not about perfection. How could it be? It’s far too last minute for that, not enough sun, not enough heat. Time is running out. It’s more about getting away with it. Basking in the opportunity. Snatching the limelight when all the early bloomers have faded out. These thorny bushes will never bear the fruit they missed out on. They bloom for no one, programmed to complete the cycle of life. The shutter closes like the blink of an eye. Ahh! But they did bloom for a reason… just for you! Beautiful thanks for giving those plants their moment of glory. I have been catching up here. Your photos are a window into the divine. You reveal the magic in decay. Thank you for sharing your extraordinary work. Przyroda rządzi się własnymi prawami. Zdjęcia są bardzo ładne. Pozdrawiam. Nature has its own laws. The pictures are very nice. Yours. A nice set of pics – suffused with sadness – as the time between each November seems to get shorter and shorter…I'm looking forward to spring like a kid looking forward to Christmas. BTW "They bloom for no one" I think you've hit on a good song title there Catherine. They're blossoming here too. Maybe like the rest of us they are trying to squeeze as much out of the season before the cold grasp of winter. A beautiful collection of images – I like the faithful dog waiting on the road. Thank God for late bloomers. They never say never and their optimism is to be complimented. Your photos are superb and evoke nostalgia and may I say a big thank you to those brave ones. Time has run out here with the recent snow…I wonder how the carrots are under cover…late bloomers are such brave plants continuing against all odds. Autumn is turning into winter where I live, but even now, ever so often, I see a lone bloom or some bright red leaves still on tree branches. At the height of autumn, I would not notice this simple pleasures. Beautiful photos as always. 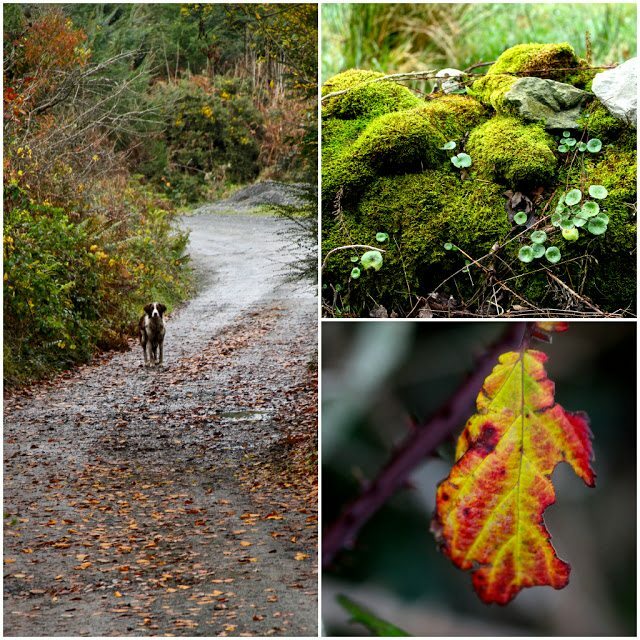 I especially like the one with the dog and the one with the moss-covered rocks. There's something magical and deep that blossoms in the darkness. Stunning imagery..and such beautiful thoughts! little surprise gifts . . . absolute enchantment. Oh my goodness, I love your words, so poetic…and that green moss, just sigh!! Love it, especially since I feel I'm a late-bloomer myself!